Most cyclists on the Capital Crescent Trail are too busy enjoying the Potomac views to stop and think about the historical provenance of their bike path. 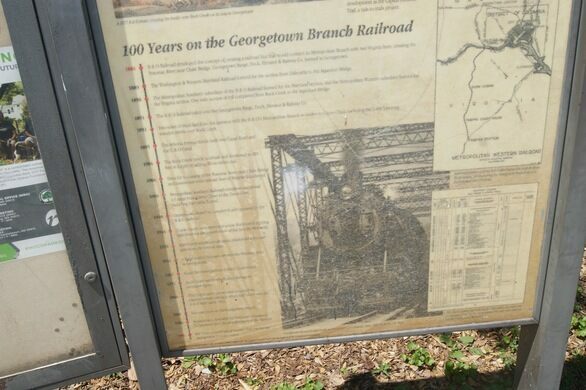 But there are little clues all around that point to its previous use as a rail spur that once carried coal to hungry Georgetown factories. One such clue is the Arizona Avenue Trestle, a hulking erector set-like web of I beams that is ludicrously overbuilt to just carry bicycles. 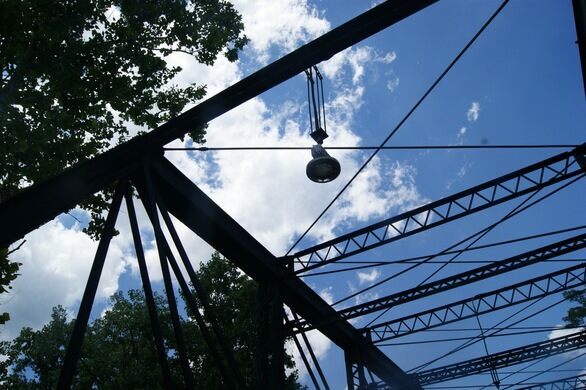 The bridge was built in 1910 to carry heavy trains over the C&O canal that passes beneath. “Built” might not be the right word, however. 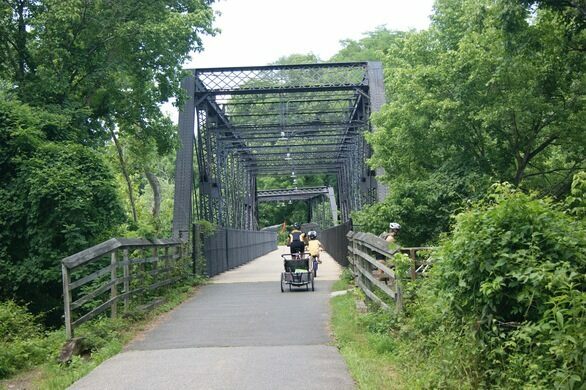 If you look closely you’ll notice the bridge is slightly crooked, as the span was actually assembled from two much older bridges that the Coalition for the Capital Crescent Trail thinks were “probably built shortly after the Civil War,” which did not line up perfectly when pieced together. While the line operated by the B&O Railroad was once busy with traffic, business declined in the post-war years and by the 1980s a single three-car train serviced two remaining clients, a lumberyard in Bethesda and the General Services Administration power plant on 29th and K street. After years of unprofitable operation, the line was finally abandoned in place in 1988. As memory of the railroad business faded, the Arizona Avenue Trestle began to attract the interest of adventurous and imaginative kids. The Washington Post recalled in 1990 that “generations of children have used it as a meeting place, diving platform and blackboard for their thoughts.” While the popularity as a local hide in the wall had its appeals, influential citizens association groups in Georgetown and the Palisades had a more broadly accessible idea in mind. 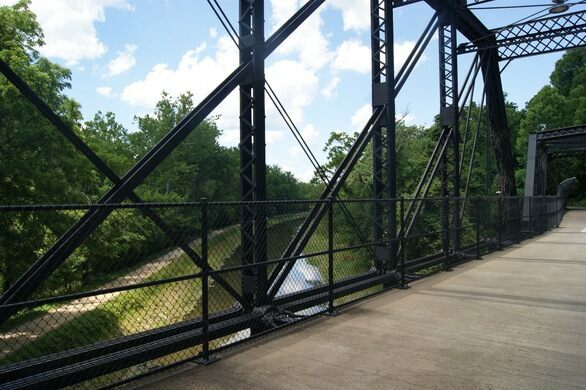 In 1990 the National Park Service purchased the bridge and trail, which set into motion a longer term conversion of the old railway into a bike trail. In its rail days the Arizona Avenue Trestle was simply trackwork supported by the steel superstructure. In 1990 volunteers laid down planks so that bikes could pass over it, and in later years the path was improved with poured cement. 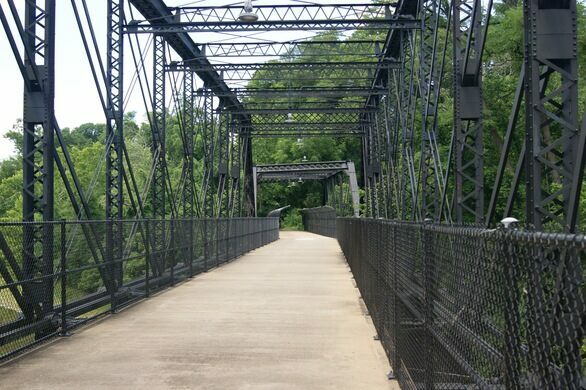 Having traded its obscurity for accessibility, the Arizona Avenue Trestle is now enjoyed by almost a million trail users every year, though few are aware of the structure’s backstory. An abandoned Depression-era zoo hidden just off the highway. An archaeological treasure trove towers over the valley of Chiavenna.